“As a major purchaser for our Corporation, I can honestly say Tammy has provided excellent service. Meeting all our needs and great follow up with any problems. I would recommend the company for small or large purchases. They offer great pricing and quality products." - Jim Kennedy, Regional Manager, MHC Management, Inc.
Financing available! No credit check, and the first 3 months are interest free! *All offers on this page or any other print, digital, or radio are subject to change and cancellation without notice. Management discretion to refuse service. Offers/Promotions can not be combined. Must show proof of residency change, school supplies brought in are subject to Management approval as valid exchange. **Please contact management for more details. Copyright, 2015 Appliance Synergy. Website built and maintained by Sterk Consulting. Appliance Synergy: Our Family Is Here to Serve You! Appliance Synergy is committed to serving our community with the best services and the best appliances available. We believe every family deserves a clean, safe, and efficient home. Since our foundation, we have helped the valley safely recycle old appliances, refurbish used appliances, and provide a large selection of new appliances. Our selection includes: stainless steel refrigerators, washer and dryer sets, gas and electric ranges, and other appliances. We are a family-run business focused on service and reliability. Our refurbished appliances are tested for safety and reliability. When shopping for used appliances in Visalia, it is important to know that the retailer has tested the appliance rigorously. In an ongoing effort to provide our customers with a stress-free shopping experience, we have partnered with American First Finance! Appliance Synergy is able to offer our customers stress-free financing with the help of American First Finance. 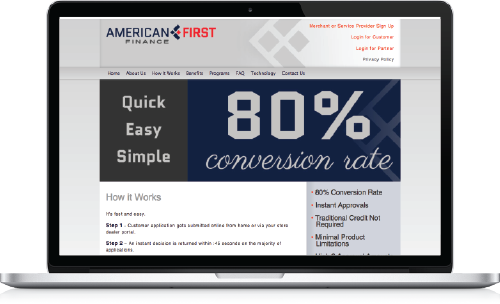 American First Finance was founded to help consumers obtain payment plans to purchase the goods and services that they want. They have great customer service and a history of excellence. It is easy to apply online, you can even do it on your phone while you are in our showroom. Click here to apply for financing! No credit needed!